Background: Directed Enzyme Prodrugs Therapy (DEPT) as an alternative method against conventional cancer treatments, in which the non-toxic prodrugs is converted to highly cytotoxic derivative, has attracted an ample attention in recent years for cancer therapy studies. 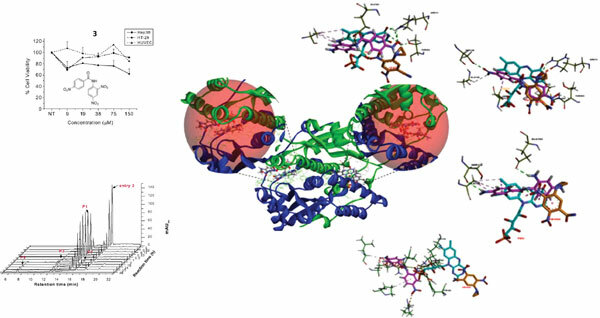 Objective: The metabolite profile, cell cytotoxicity and molecular modeling interactions of a series of nitro benzamides with Ssap-NtrB were investigated in this study. Method: A series of nitro-substituted benzamide prodrugs (1-4) were synthesized and firstly investigated their enzymatic reduction by Ssap-NtrB (S. saprophyticus Nitroreductase B) using HPLC analysis. Resulting metabolites were analyzed by LC-MS/MS. Molecular docking studies were performed with the aim of investigating the relationship between nitro benzamide structures (prodrugs 1-4) and Ssap-NtrB at the molecular level. Cell viability assay was conducted on two cancer cell lines, hepatoma (Hep3B) and colon (HT-29) cancer models and healthy cell model HUVEC. Upon reduction of benzamide prodrugs by Ssap-NtrB, the corresponding amine effectors were tested in a cell line panel comprising PC-3, Hep3B and HUVEC cells and were compared with the established NTR substrates, CB1954 (an aziridinyl dinitrobenzamide). Results: Cell viability assay resulted in while prodrugs 1, 2 and 3 had no remarkable cytotoxic effects, prodrug 4 showed the differential effect, showing moderate cytotoxicity with Hep3B and HUVEC. The metabolites that obtained from the reduction of nitro benzamide prodrugs (1-4) by Ssap-NtrB, showed differential cytotoxic effects, with none toxic for HUVEC cells, moderate toxic for Hep3B cells, but highly toxic for PC3 cells. Conclusion: Amongst all metabolites of prodrugs after Ssap-NtrB reduction, N-(2,4- dinitrophenyl)-4-nitrobenzamide (3) was efficient and toxic in PC3 cells as comparable as CB1954. Kinetic parameters, molecular docking and HPLC results also confirm that prodrug 3 is better for Ssap-NtrB than 1, 2 and 4 or known cancer prodrugs of CB1954 and SN23862, demonstrating that prodrug 3 is an efficient candidate for NTR based cancer therapy. Ssap-NtrB, cancer therapy, cell cytotoxicity, prodrugs, quantum chemical parameter, molecular docking.